It's weekend again, and usually the Saab news coming out of Sweden on weekends is limited. Swedes love to take the weekend off. And last night was midsummer celebration, and I guess many Swedes will spend the better part of this day in bed! So instead let's look at a couple of pieces from abroad. Saab cars are weird, a bit odd, not particularly spectacular in any way other than they are kind of cool. 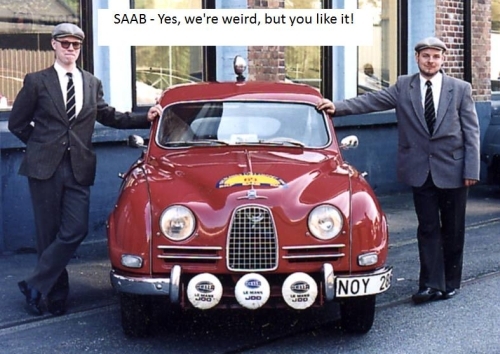 Nobody can really make fun of you for driving a Saab, it's definitely a conversation piece. It has a neat history and a coolness without any negativity that's usually associated with other brands. Saab is like that favorite uncle who gets drunk and says silly things, but everyone still laughs and loves him to death. Don't die Saab, I'll miss you. Second piece comes from The Wichita Eagle. It's a good piece that sums up the current situation very well without speculating too much on if, what and when. And they also have a personal touch as they have talked to Ron Fortune of Euro-Tech Saab. "I think it's more than likely (Muller is) going to get a deal done," Fortune said. "But there's definitely the potential that he wont get a deal done." Both pieces are a recommended read. Enjoy your weekend!